Piecing together the career of a WW1 Merchant Navy ancestor without knowing which ships they served on has been virtually impossible up until now. Crew lists for Merchant Navy ships are held by several different archives and there is no index to the names listed. The National Maritime Museum and The National Archives have been working in partnership to make the crew lists for the year 1915 available online for the first time. 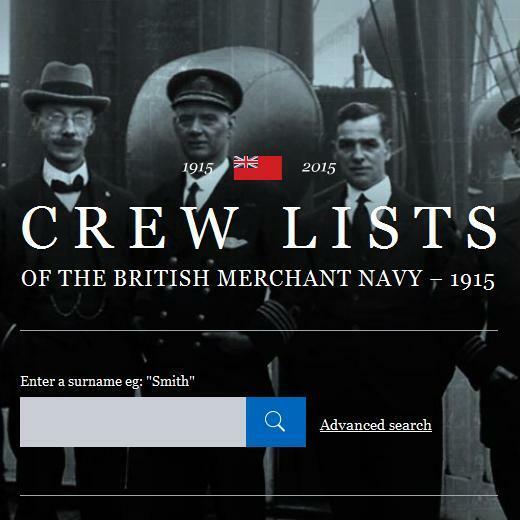 Around 39,000 crew lists have been scanned and transcribed by volunteers from all over the world to mark the First World War centenary. If you are tracing the career of a Merchant Navy man during the First World War this could provide a massive breakthrough in your research. I was actually planning a trip to the National Maritime Museum in a couple of weeks to look up a crew list for my Great Grandfather. I’d finally found the name of a ship on a WW1 medal roll and had tracked down the crew list to the National Maritime Museum.